Charlotte Darbyshire is the co-artistic director of Candoco Dance Company, a contemporary dance company of disabled and non-disabled dancers. The company is presenting work across the UK and we have just reviewed their show at London’s Sadler’s Wells, which our wonderful reviewer Francesca Marotto said “celebrates the power of diversity”. Charlotte is not only an artistic director but she’s a choreographer, performer, dance lecturer, director and teacher who’s been championing diversity in dance for 25 years. You can listen to our podcast with Charlotte or read the interview below. Q: How and when you started dancing? A: Like a lot of young white middle-class British girls, I danced from a small child. I guess what was a little different, was that my grandparents founded one of the first residential schools for disabled children in the country – that organisation is celebrating its 50th year. I was born there and lived there as a small child, so I have been working with disabled and non-disabled people for as long as I have been dancing. When I was in high school, I went to dance club and I also ran my own dance club for disabled adults, and the same at college. When I was at the Northern School of Contemporary Dance, the director at that time, Alison Becket – a very inspirational ballet teacher – she had a disabled son and ran a youth group for disabled young people, and I used to teach them movement once a week. Q: How did Candoco come about? A: Candoco began as exploratory movement class with Celeste Dandeker-Arnold who was a dancer with London Contemporary Dance Theatre. We danced with them in the early 70s, and she had an accident on stage and became disabled. And she did think, at the stage, that her dance career was over, and indeed it was for years. Then, when she met up with visual artist and performer Adam Benjamin – who I think they met at the spinal injury centre in Middlesex – they started a weekly movement class and very quickly they came to do a residency at Yorkshire Dance and I went along as a student. We were then invited to perform work in Southbank at the Ballroom Blitz that summer and there was a huge response from the audience and from the festival and so we then launched Candoco. I performed with Candoco and my dearest friends for the first 7 years of the company and then went on to have my own independent dance career, performing with various companies and making my own work for theatre and film mainly, and also teaching. I danced with Candoco at the very beginning of my career and at the beginning of their journey, whicth was exhilarating and it influenced everything that followed. It set the bar for me in terms of best practice, and in terms of creating an environment that I wanted to live and work in – one that is diverse, creative and inclusive. Since then whether I am teaching – I was a lecturer at Trinity Laban for 10 years and then at the London Contemporary Dance School – in a mainstream training institution or working with land mine victims in Cambodia for example, which is an example of the work I have been on, my approach is the same; I am listening and learning, I am in relationship to whomever is in the room; and that is how I still love doing what I am doing. Q: How did you decided that you were going to make this the single focus of your practice? A: It’s become part of who I am and what I do. I think the environment that we grow up in is very influential, whether we like it or not, and it is natural for me to be in what was then called an ‘integrated environment’. But certainly an environment that is made up of difference, and celebrating those differences or at least, in the day, accept those differences. I came from a family of artist as well – my mom is a painter, my brother is sculptor – and so I was fortunate to have a creative environment. I think dancing was something that was obviously my calling, but also when I went into full-time training to become a professional dancer, I think if I am honest, I really struggled with some of the more traditional approaches to dance and some of the traditional aesthetics and some of the more classical languages. I really appreciate that I learnt them, because they gave me more choices and I learned from each of the different physical languages in that traditional training, but I really was on a quest to find my own voice through my movement. There was something about working in an environment where everybody has different bodies and backgrounds and perspectives. Where we could almost create from scratch. We were trying to find a way to move together that excited us, challenged us, and reflected our relationship to moving around at that time. This was very liberating and inspiring. It became a place where I could incorporate all of the skills and experiences I had gained in dance training, but woke up something new which became about being in relationship to somebody else. Which of course we all are, but it highlighted it and stimulated something in me, and highlighted that all dancers are in that relationship – whether it is the environment you are in, the music, time passing, the audience, or your relationship to your own body. I think working in an inclusive environment has kept that very conscious to me. It is almost like it enables me to return to the essentials of why I did it in the first place, and what it is to strip it back and work with different dancers of different experiences and backgrounds. Also it maintains a human element, which I really need in my dancing. I want to reflect the whole of me when I am dancing with somebody, I want to see who they are, their psychology. There is something about working in this environment that gave space to all of that. I feel very fortunate to work in that way. Q: When you were first invited down to Southbank, did you image or have a sense of what you were potentially creating in terms of the importance, the discussion, the narrative and the questions that Candoco poses to the audience and to the dance industry? A: I think yes and no. We all knew straight away that it was something not only exciting, but something significant. A lot of us were in that environment, in that room for the first time. 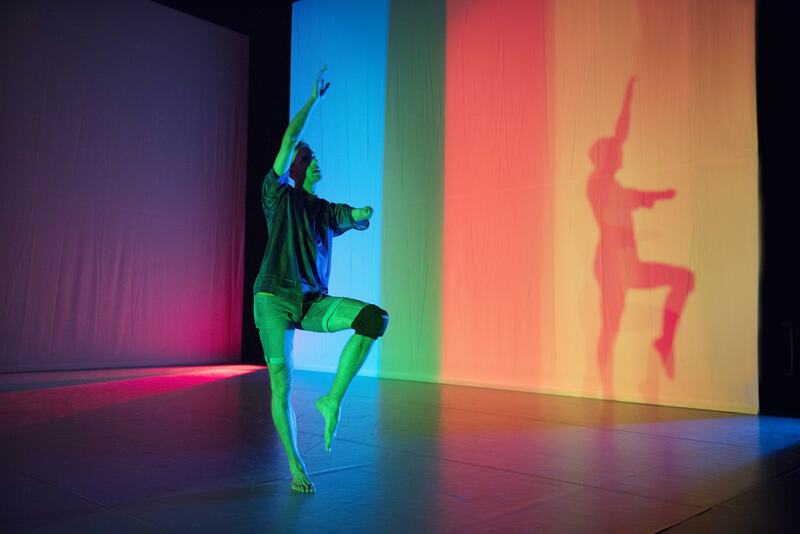 I remember a workshop at the Yorkshire Dance centre, there was a now very well known dancer called Dave Toole – who was also a founding member of Candoco and is now dancing with another inclusive company called Stopgap. At the time, he was a postman and his mates had dared him to come to the workshop because he was a natural performer, an exhibitionist, who loved singing and dancing. I remember sitting in a circle next to him and catching his eye and thinking ‘oh, wow, this is new, this is unknown territory for all of us’. It felt like a genuine discovery, it was exhilarating. We made a piece that week which we were all totally excited by and we performed it for the students at the Northern School of Contemporary Dance by the end of that week, and there was an absolute standing ovation. I was in my first year at that time, so I was astonished and delighted by this. It was off the back of that that we got invited to show it at Soutbank and where we were met with the same reception. I don’t think any of us could have predicted the path ahead, or the social-political impact. But we knew we were doing something new and exciting and important, and wherever we went there was an energy that was contagious. Then when we gave workshops things took off, people discovered things about themselves and each other that they didn’t know, and we were doing the same and it generated an energy that began to slowly have an impact on the dance world, and it is still doing that. A: It is certainly not new anymore as a concept – the Paralympics have shifted it, activists and artists from lots of different art forms have shifted it too. Right from the start of Candoco – because Celeste had been a professional dancer, she was very clear that it was about the quality of dancing, and that we should commission leading choreographic voices of the time. At that time all the able bodied dancers – as we were called then – were professionally trained, but it was unusual for Celeste to be the disabled artist and to have professional dance training and had worked in the industry. 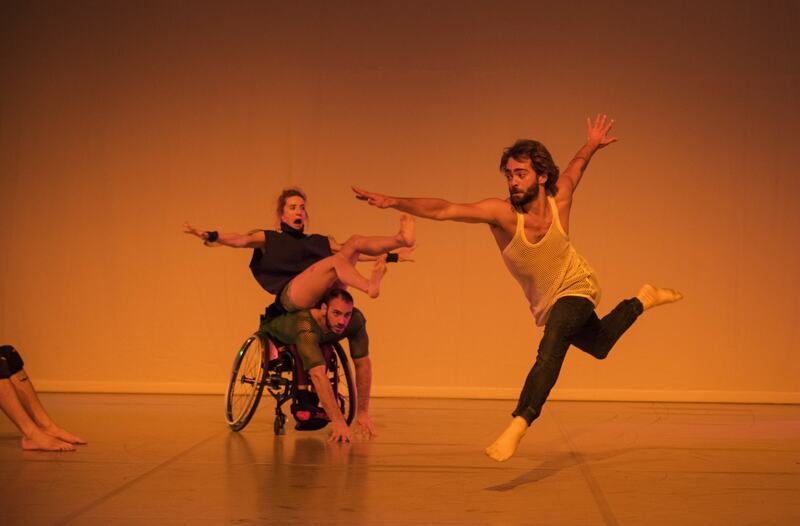 For a while, there was a gap in training and experience between disabled and non-disabled dancers. now I think the reason Candoco has held its place is because we have been chipping away at the access to education and training and professional artist development and different opportunities. Now the dancers we have in the company are all trained, and they all are highly skilled and competent, courageous performers; which means we can still keep pushing and developing. That is why Candoco has held its place, it is about humanity, acceptance, diversity; it is about dance as an art form we push and develop. Our learning programme at Candoco always had learning at its heart, both for those in the company and for the participants. That certainly advocates dance for all. I think what we demonstrate on the main stage, in the current model, is highly skilled, talented dancers, whether disabled or non-disabled. It is the access to training and the opportunity that we need to fight for, so a lot more people can access it at that level. We just took Jerome Bells’ award-winning piece “The show must go on” to Paris for 3 weeks, with was extended cast, their age ranged from 20 to mid-70s. That was an exceptional piece. There you have real diversity in terms of background, and the quality of the work was uncompromising. That was the skill of the choreographic concept. Q: You mentioned providing access to training and you have highly skilled dancers and there is a rich pool of talents to choose from, as an artistic director how do you choose the artists to join your company? A: Interesting question, I found we all come from very different roots, there is no ‘one’ way, no one root. Certainly, as a company we are thinking a lot about the root, the future artists and how can we provide provision, for example, for young children at primary level. At the moment in the UK, there is a really strong youth programme, with lots of opportunities for young people. There seems to be a gap for disabled people between that youth programme and those that can access higher education. That’s the gap that we want to address and provide provision for, particularly for disabled dancers. Then after accessing higher education, at the end how do you gain access to a company and other companies in the industry? Again, this is an area that we want to prioritise, because if you do make it through higher education as a disabled artist, how then will you get to work in the sector? There is not a big representation of disabled artists in the other companies, although it is beginning to change. In terms of how we choose our dancers, we scan the world, the current dancers; one we invited to audition from America and another from Brazil. We have a whole network of disabled artists that we are following, providing training opportunities for, inviting them to join us. Also there is a whole community of disabled artists that we don’t know yet, that we could learn from. Q: Is it about the next generation in terms of the artists or the emerging voice that is now coming from this disabled dance community? A: I think we live in a world where everybody is beginning to appreciate the difference which is our life. We are in a political context that is frighteningly narrow at times, there is a fear of differences. I think young people and artists are wanting to explore and develop this territory. I know for many of my students at the London Contemporary Dance School, Candoco is a very attractive company for them. It is a company where one feels like they can be challenged and stretched and belong. Q: Also in a professional context dance artists would feel like they have ‘arrived’ by being part of the company? A: You get to tour the world, dancing at all sorts of levels, right from primary school, community level right to the professional level, and you get to work with an incredible number of choreographers. I think it is a very attractive company to work for, but I am also aware that when we started, 25 years ago, there weren’t many other companies like us, but now – and I hope we still are at the front of this – there are many companies like us right now, all over the world, many of which came out workshops with Candoco. For example of the work we did in Colombia, a company came out of the education and participatory project that my friend and I did there a couple of years ago. That is the case in many countries, certainly across Europe. A: Celeste was really a pioneer in her desire to challenge perceptions of dance, and we are still committed to that, but I also think that we need to challenge the perception of disability now. Our understanding of disability is changing rapidly and the current state doesn’t necessarily represent that diversity of ability and disability that we now have in society. That is a challenge for the future. Q: As a choreographer you’ve been making work for many years, how do you describe your choreographic language? A: More recently I’ve created work for the choreographic camera more; but the truth is I don’t perceive myself as a choreographer. It is funny, I have friends that are choreographers and I would even say that Ben Wright, my artistic co-director, is the choreographer and perceives himself as such. It is interesting because I see myself more as a director and I haven’t investigated this enough. I am a little self-conscious saying it publicly, but I haven’t invested in the choreographic craft in a way some of my friends have. But I do think that I have a lot of experience and I am interested in people. So what I think I do is that I respond very directly, and I hope sensitively, to the people that I am working with. And any work that I create, the choreography and the shape that the work takes and comes out is always in response to the people in the room. That is choreography, but I feel that I am more comfortable in the role of director and I think maybe that is why I have come to film more. Ben and I, even when we are writing a speech, for example, he lays down the first draft and then I completely tear it apart. As a choreographer he is quite happy with the practice; putting the first steps on the snow if you like; where I like the room to be fully charged and everything in there already and then I am happy to organise it. A: I also made a film last year as well that has just won an award at the dance festival in Limerick. That was with two dear friends of mine who also were dancers with Candoco and now are associate artists wutg the company. Q: Tell me about that experience and it is different to creating work for stage or for a venue with an audience? A: The way I approach it isn’t necessarily different, I think it is the same whatever context I am in. I try to work with curiosity and generosity, and it is about exploration for all of us. But I think film allows a kind of intimacy. I think because of my work in this field, for over 25 years, I really feel that I have witnessed and learned something quite unique in a way, and it is becoming less unique which I am very excited about, but there is something about film that allows you to get really close up and to really direct the gaze. A: I think through our experience, you learn new answers and the psychology. I am interested in stripping away or giving visibility to the kind of psychological or emotional perception, reality or a particular relationship or mode of performance. I think it allows you to really get in there and make visible some stuff that sometimes is not visible. Organising things in a space perhaps how a traditional choreography might be, but more about revealing the person in relation to context. That excites me a lot. A: “The Lily the Rose” was inspired by the opening soundtrack by Jules Maxwell. Actually the performers themselves, Welly O’Brien and Kate Marsh, it was their initiative. I have known them for many years. I know they trust me as a friend and filmmaker, and they said they are making their own work, a duet together that they wanted to tour. But they have children and didn’t want to be on the road, so they said that they would like the next project to be a film and for me to capture something. They offered me some starting points and material which was the base – they were initially inspired by Daisy and Violet Hilton, Siamese twins in the 30s in America who were pushed forward and sensationalised, and exploited, but they did have a successful career for a long time. There was something about their career that inspired these two artists in their choreographic development. And something about the intimacy of their relationship because they are very close, best friends, like sisters, and they tour on the road together and they both have a disability that I think makes them very close. There is an empathy there that I can assume or imagine. So they asked me to make this film and gave me complete freedom and poetic license to do what I wanted with the material they offered. And because I have known and loved them for many years, I pushed them a bit and I tried to tread the edge where it is intimate and risky without it being too exposing. But I did expose a side of their relationship that they hadn’t made public yet. It has been an interesting process for the three of us as collaborators. I think it was nerve-wracking for them to go to festivals and to let it go beyond their reality. I think it has been quite liberating as well. But it is important to all of us that the audience knows it was their initiative and their invitation, that it wasn’t me saying to them “can I make a film about you?”. They wanted me to capture something about them. It was fictional and real, I evolved the real story with the fictional characters. It is kind of a poetic portrait. Q: After 25 years of experience and journey that is quite unique, do you think about the legacy that you want to leave behind? As a dance lecturer that you teach experimental anatomy into contemporary technique and choreography performance and teaching practice, and you create work and film. How can you capture all of this experience so that we never lose it and it is passed on? A: I think this sense of responsibility, and also opportunity, is something that has become more conscious for me in the last couple of years and why ultimately I applied to be the artistic co-artistic director of Candoco. I really enjoyed that rich mix that has made my dance career. My performing feeds my teaching, which feeds my choreography as it does with all dance artists. I am very aware that in a way my path is unique, as is everybody’s – we all have a very particular path that is made up of the very particular combination of experiences and opportunities, struggles and failings as well as achievements. I really don’t see myself as different from everybody else in that way. I am only where I am because of all the people that I had the opportunity to work with; I am so affected by them. We carry imprints of each other. But, I think maybe as I approach 45 this week, I do have a lot of experience at my age and I do want to share it and I do want to do my part in terms of sharing that experience or helping to shape or shift our understanding of what is possible and I want to continue to learn and to be challenged. I want to be in an environment where I can ask questions and be questioned. I want to continue to grow artistically and we are in a different culture now. Even speaking to some of the disabled artists in the company recently, one of them said to me the other day: that every single time she steps on stage, she says she is so aware of all of those who have gone before her, who made it possible for her to be there, and how she really feels a responsibility to do everything that she can to open the path for those who follow. I was very struck by this and I thought ‘wow, she is so conscious of that’ and as a non-disabled artist I don’t think we had that sense in the early days, it was more that we were just loving what we were doing and we wanted to share it. Now we have an industry and a responsibility, and we do have a long way to go. What we can do is to help shift the ecology of dance as it develops. Q: What advice would you give to other dancers, particularly aspiring disabled dancers who would like a career in dance? A: Oh gosh, I don’t know, I risk sounding very hippy here! I think listening to your body is key as a dancer and actually just as a person. I think that is a huge anchor that helps you to continue to learn from your own environment; helps you to navigate through challenges of being a dance artist and it keeps you connected to your own creative voice when you are trying to negotiate the demands of different languages that dancers have to navigate. A: You mentioned the word inspiring, that is the key. I feel inspired and I have been continually, and that is probably one of the top tips I would give. To have the courage to put yourself in the environment where you feel inspired. To go out and see work, make connections with people, take opportunities that come your way. Have the courage to follow the opportunities that arise and put yourself in an environment where you feel inspired and where you can catch that energy and nurture it, because it is challenging. I really do believe that dance is going to be richer for all of our different contributions. We need to keep doing what we are doing. A: We are doing an International lab in the summer for dance artists from all over the world and we offer regular dancer development days and workshops in a number of different contexts. Just check out our website and contact us and we will be happy to direct you!